2000 BC – 1300 BC. Look out he's got a stick! Chariots were a war winning weapon. By the time upper and lower Egypt were first united and their society coalesced around 3150 BC, the Egyptians had already been using bronze weapons. They used bronze for spearheads, axes and maces. It was also during this period that the composite bow came into use, made with horn and wood. Over the following centuries as the Pharaoh’s dominated ancient Egyptian society they began to standardize weapons, stock pile arsenals and borrow weapons systems from invading peoples. Eventually these weapons developed into the quintessential Egyptian weapons discussed below. Iconic Egyptian warriors. A spear man with leather shield and an archer. Two kinds of Egyptian axes are shown in this image, one type looks like a fan while the other is hatchet like, although it is missing a stabalizing eye hole. The bow long remained the main armament of Egyptian forces throughout Egypt’s long military history; perhaps due to the lack of armor worn by Egyptian warriors and their enemies in the hot climate where they operated. The ancient Egyptian’s continued to use both long bows and composite bows throughout their history. Arrowheads switched from stone to obsidian during the pre-dynastic period. Obsidian was exchanged for bronze around 2000BC, and finally, domestically produced iron arrow heads began to appear around 1000BC. 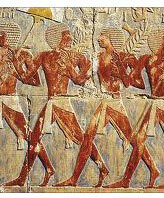 Most archers were foot soldiers however Egyptian chariots also carried them. Archers provided range to the chariot warriors, and when range and speed were combined the chariot mounted archers became dominate figures on the ancient battlefields. Nubian mercenaries often served as foot archers and are said to have been their best bowmen. The khopesh is probably the most iconic of the Egyptian weapons. It features a curved, thick blade and measured about two feet long. A khopessh has a thick, crescent shaped blade that is used for slashing. There are several styles of this wicked weapon, and one very well designed style that combines the advantages of both of them. Basically one style has a hook on the end that is used for grabbing people, their weapons or shields and the other variety has a point on the end that can be used for stabbing. The hybrid type has both a point and a hook on it, and this can be used to pull an opponent’s shield down then thrust (stab) the end of the khopesh into their face. There is nothing nice about a Khopesh, it leaves nasty wounds and looks vicious. Another weapon that the Egyptians developed with a uniquely Egyptian style was the battle axe. The first Egyptian battleaxes were produced during the Old Kingdom period, around 2000 BC, and were constructed of bronze. Their crescent shaped blades were affixed into grooves on long handles. This was a weaker connection than the axes made by their contemporaries that featured a hole through the axe head that the handle fit through, but it served their purpose of slashing unarmored troops and hacking through the hide covered, wood framed shields used at the time. However, once they met the Sea-peoples and the Hyskos they found their axes to be inadequate and changed their design. Egyptian axes could be used for hacking or be thrown. Another, interesting and all Egyptian weapon is a fan like axe that can be seen in the top right image titled odd Egyptian weapons. This weapon had a fan shaped head used for slashing, mounted on a pole. However, this weapon isn't a true axe and may have been for ceremonial uses only. 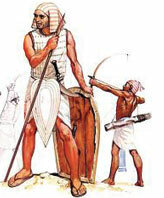 The second largest contingent in an Egyptian army (after the bowmen) was the spearmen. Spears are cheap and it takes little training for levy soldiers to figure out how to use them. Charioteers also carried spears as secondary weapons and to keep enemy infantry from getting to close. Similar to arrowheads Egyptian spears progressed through stone, obsidian, copper and finally iron stages. The Egyptians must have had a place in their heart for this weak little weapon (weak compared to bows and slings, both of which the Egyptian’s used). A throwing stick was essentially a boomerang that didn’t come back. Perhaps it stuck around as long as it did because it was a cheap secondary weapon for infantry troops. Although a throwing stick was unlikely to kill anyone it could have also been used to distract an enemy during melee combat. While one guy throws a stick at your face another guy would stab you in the gut, that kind of thing. Famously, they were also used for hunting waterfowl along the Nile, even by Pharaohs. Chariots represent more of an Egyptain weapons platform than an actual weapon in itself; however, chariots became indispensable to the Egyptian armies. The Egyptians built fast, light chariots and would use them to race into position shower their enemies with arrows and retreat before a counter attack could be launched. These strikes would demoralize an enemy army, making them feel helpless against further attacks. Egyptian chariots carried a driver and an archer and were assembled at the battlefield. At the Battle of Kadesh in 1274 BC, 5,000 – 6,000 chariots slugged it out. Kadesh was probably the largest chariot battle in history, pitting the heavier Hittite three man chariots (they added a spearman) against the quicker Egyptian two man chariots. In the end both sides claimed victory and one of the first known international peace treaties was signed.